Hida Viloria | Born Both Selected as one of 10 Adult Books for Teens! Born Both Selected as one of 10 Adult Books for Teens! 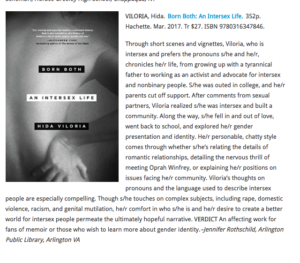 I am thrilled and honored to have my memoir Born Both: An Intersex Life selected by School Library Journal as one of 10 Adults Books for Teens, and for the fantastic accompanying review! ← Presenting Keynote at Lambda Archives 30th Annual Gala!